For Vietnam, the United States (U.S.) and ASEAN are the most important partners in foreign relations. Therefore, there have been many studies mentioned bilateral relations Vietnamese – U.S. or Vietnam - ASEAN. 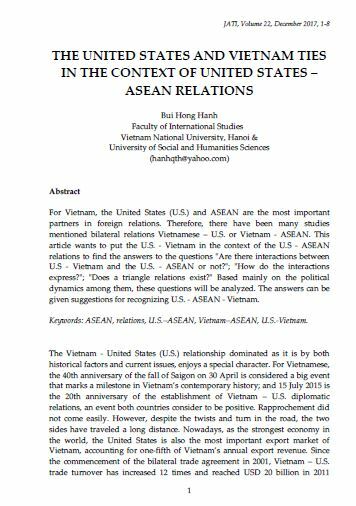 This article wants to put the U.S. - Vietnam in the context of the U.S - ASEAN relations to find the answers to the questions "Are there interactions between U.S - Vietnam and the U.S. - ASEAN or not? "; "How do the interactions express? "; "Does a triangle relations exist?" Based mainly on the political dynamics among them, these questions will be analyzed. The answers can be given suggestions for recognizing U.S. - ASEAN - Vietnam. Keywords: ASEAN, relations, U.S.–ASEAN, Vietnam–ASEAN, U.S.-Vietnam. HONG HANH, Bui. THE UNITED STATES AND VIETNAM TIES IN THE CONTEXT OF UNITED STATES – ASEAN RELATIONS. JATI - JOURNAL OF SOUTHEAST ASIAN STUDIES, [S.l. ], v. 22, n. 1, p. 1-8, dec. 2017. ISSN 2600-8653. Available at: <https://jati.um.edu.my/article/view/10242>. Date accessed: 20 apr. 2019. doi: https://doi.org/10.22452/jati.vol22no1.1.